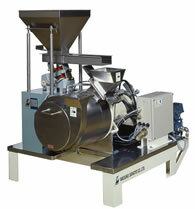 The concept for its development is easy disassembility for cleaning and part-exchange. Despite its large capacity, the compact design requires installation space of only 1.5ˇ, the feature which makes the unit possible to be placed at the limited space in factort. Cooling-water jacket keeps the temperature of processed material low.